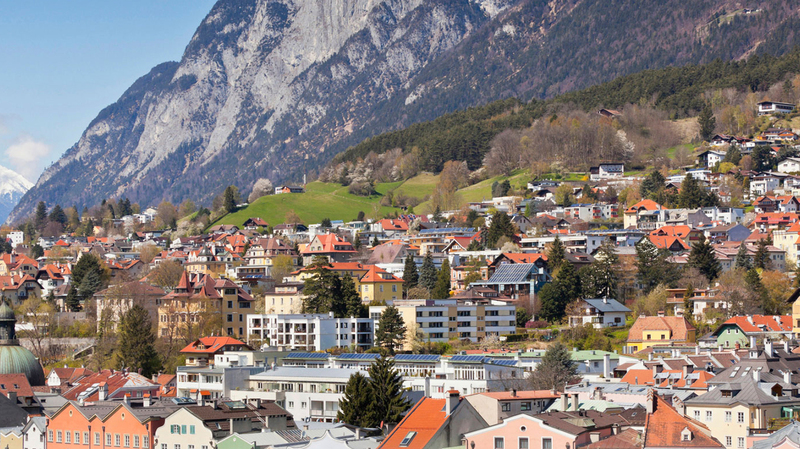 Search for the best flight prices from Manchester to Innsbruck. Compare prices, book today and save money with Manchester Airport. The capital of the Austrian Tyrol is a legendary alpine town. With some of the world’s best (and most reliable) skiing, it’s one of only a very few places to have hosted an Olympics more than once (in 1964 and 76). With direct access to the Austrian Alps, it’s surrounded by three peaks each of over 2,000 metres, not to mention proximity to the Brenner Pass. There’s a chill in the air – particularly as the nights start to draw in – but the welcome’s every bit as warm as you could wish. Innsbruck mixes swish urban hotels with ski hotels and boutique guesthouses, while nearby villages have some lovely little B&Bs. Top dog is the five-star Grand Hotel Europa (Südtirolerplatz 2), a local landmark for almost 150 years, and ideally located opposite the train station. Meanwhile, quirky, romantic Hotel Goldener Adler (Herzog-Friedrich-Strasse 6) is a 600-year-old gem. For a very affordable rate, you can stay in rooms once used by the likes of Mozart, Goethe and Paganini. Or, if you prefer your hotels modern, try swish, designer choice The Penz Hotel (Adolf Pichler Platz 3). Traditional Tyrolean sweets, bacon and schnapps top the list of sought-after souvenirs in Innsbruck, but there is plenty more to snap up. Big shopping centres include the Rathausgalerien (Anichstrasse 24) or Kaufhaus Tyrol (Maria-Theresien-Strasse 31), while the Old Town shelters a range of little independent shops. Browse sweets in the irresistible confectioners Konditorei Mundingor (Kiebachgasse 16), Zimt & Zucker (Gumppstrasse 41) and Rajsigl (Maria-Theresien-Strasse 18). Pick up some gingerbread or candles from quaint little Tiroler Wachszieher und Lebzelter (Pfarrgasse 5), or schnapps and whisky at Vom Fass (Anichstrasse 1). There is also a Saturday morning farmers’ market (Markthalle) for more culinary keepsakes. Gourmet restaurants, traditional taverns, mountainside eateries and cosy cafés are sprinkled around Innsbruck, making it a pleasure to wine and dine here. Perhaps the best-known foodie haunt in town is Alfred Miller's multi-award-winning Schöneck (Weiherburggasse 6), which also enjoys a garden and great views. For a taste of modern Austrian cuisine, try Das Schindler (Maria-Theresien-Strasse 31). Or for an authentic and refreshingly affordable Tyrolean feast, head to Restaurant Ottoburg (Herzog-Friedrich-Strasse 1), which inhabits one of the city’s oldest buildings. If you’d rather head to the hills, mountain restaurant and ‘chill-zone’ Seegrube Alpenlounge (Bergstation Seegrube) has stunning views over Innsbruck. Ski jumpers zing skyward from the Bergisel Olympic take-off ramp in this, the internationally renowned Four Hills Tournament’s third round. Mad skills are on show every year at Air & Style, the biggest snowboarding competition in Europe. Big-name bands, parties and other events also entertain the tens of thousands of spectators at Bergisel. Athletes attempt to pole vault as high as the famous three-storied Golden Roof balcony, which fittingly once served as the Emperor’s royal box for watching tournaments below. The Imperial Palace courtyard is the rather grand backdrop of the annual Innsbruck Proms, a series of free outdoor concerts featuring Tyrolean brass bands and groups from all over the world. Wash sweet Tyrolean pastries down with mulled wine and enjoy the festive celebrations in ski resort Igls, 5km from Innsbruck. The Krampus run sees dozens of devil-like characters terrorising the streets, and St Nicholas parades through town with children dressed as angels, shepherds and wise men.